In the long history of Sunderland AFC there is one team that stands head and shoulders above them all; The Team Of All The Talents. It was alleged that it was William MacGregor, on the Board at Aston Villa and the founder of The Football League, who essentially coined the term. 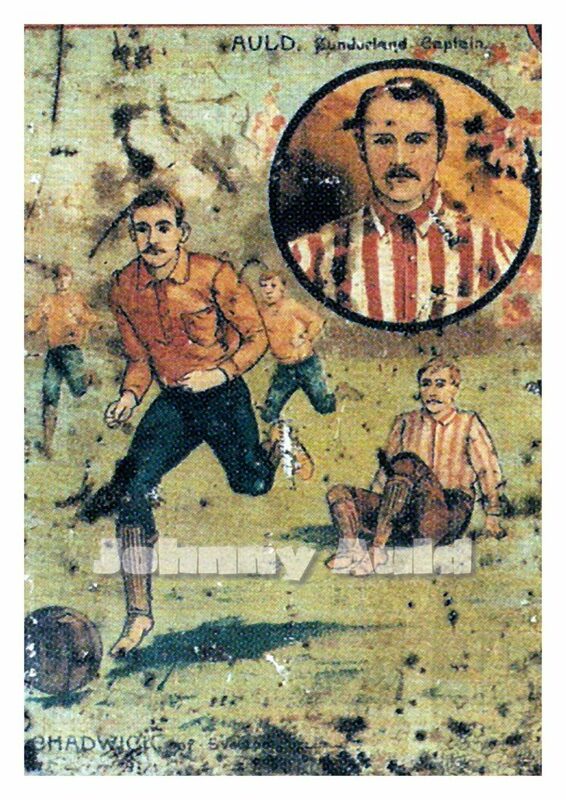 Having witnessed The Black Cats 7 v 2 demolition of The Villa at Newcastle Road on 5 April 1890 he was quoted as saying that “Sunderland had a talented man in every position”, and so a legend was born. It should be recognised that at the time Sunderland were not in the Football League but it was probably that win, more than any other than laid the foundations for the club to be elected into the league the following season, although this SAFC team had also thrashed The Invincibles of Preston North End previously, a game that shook the football world. It was on the 30 April 1890 that The Sunderland Echo first used the phrase “Team Of All Thew Talents” to describe Sunderland AFC in their summation of the 1889/90 season, a campaign where in 11 home games against league sides, the red and whites lost only twice. By the time of the article Sunderland’s claims for league football had proved irresistible although as the most Northern outpost of league football the club had to guarantee visiting clubs travelling expenses, an obligation that was never honoured as there is no record of any club claiming such expenses from the red and whites. In the 1889/90 season Sunderland played 31 games at home, and remained undefeated in all but 4, scoring a remarkable 116 goals in the process. The Echo confidently predicted that Sunderland would end up top 6 in their first season in the Football League. they werent far off as the club ended 7th behind Blackburn Rovers. Campbell, Hannah and Harvie had been brought in from the Renton club in Scotland and Porteous arrived from Kilmarnock. Stevenson arrived from Kilburnie but perhaps The Team’s most important and influential figure was the captain Johnny Auld, originally a half back and also a Scottish international player, who arrived from Third Lanark, he had been converted into footballs very first centre half. Auld had a contraversial past having been caught up in an expenses scandal involving Third Lanark’s cup tie with Partick Thistle the season before he joined Sunderland and indeed he had to appear before a SFA committee to answer the charges, that were ultimately not proven. In between his games for Sunderland he ran a corner shop on Union Street that sold shoes, boots and slippers. Adverts for his shop were regularly viewed in various editions of the Sunderland Echo. By the April of 1891 Sunderland’s reputation has grown, so much so that The London Star made the following announcement in advance of a game in the capital; “we have to thank Royal Arsenal for so many football treats already that we need not hesitate to acknowledge what is perhaps the greatest of them all; a visit the famous Sunderland Club. The team of all the talents play at Plumstead on 25 April”. Sunderland struggled at first in the 1890/91 season as they came to terms with playing the best teams in the land, winning just 1 of their first five home league games, however six consecutive home wins to end the season was a marker for what was to come. Having learnt from their first two seasons together The Team clicked and won the clubs very first league championship in the 1891/92 season. The campaign was remarkable. The red and whites won the league by 5 points, won all 13 home games, scoring 55 goals in the process and in Johnny Campbell they had the league’s top goalscorer. Campbell, almost without peer at this time scored 31 goals. The club also notched the league’s biggest away victory, 7 v 1 at Darwen. Sunderland remained by far the most Northerly outpost of the Football League with the other clubs all bunched together in Lancashire and The Midlands. In The Sunderland Echo’s write up on the League Champions in their 14 May 1892 edition, a critique of all the players was given. The write ups were accompanied by beautiful drawings of each player courtesy of the Sunderland Photographic Company based in Fawcett Street. The annual meeting of The Football League had taken place with Sunderland represented by their manager, Tom Watson. A second division was constituted but Sunderland were given the ultimate compliment with the chairman of the League stating that given the travelling involved for Sunderland, their sporting play and their success he had no hesitation in saying that they were as good as anything he had yet seen on a football field, which included a direct reference to PNE’s Invincibles. The Team was champions of England again the following season and once more they remained unbeaten in 15 home games, winning 13 and scoring 58 goals. This time they won the title at a canter by an incredible 11 points and with a goal difference of plus 64! Johnny Campbell, who else, was once more the league’s top scorer with 31 goals and once more the red and whites had the divisions record away win; 6 v 0 at Accrington. They had the longest unbeaten run, 10 matches, from the January until the April of 1893. On 15 November 1892 The Sunderland Echo carried a report on Sunderland’s 4 v 0 win against Royal Arsenal. The side was still being referred to as the Team Of All The Talents so we know that the term and the team had not yet expired. The Echo, reflecting on the clubs second league triumph wrote the following; “the Wearsiders are admittedly the best all round combination of association footballers now before the British public”. For “British” read “the world” as no one came close, in those far off days, to the English and “Scotch” sides. The best in the world would of course be proven in 1895 when the club were crowned World Champions. In 1893/94 Sunderland ended up second in the league to Aston Villa and the two clubs would endure a fierce rivalry, recognised by The National Football Museum as world football’s first club rivalry. Villa ended up as Sunderland’s bogey side but Sunderland did mange to put one over on them at various points, none more so than when we claimed the championship in 1912/13, a season where Villa had to settle for a runners up spot. That season of course saw Villa win an iconic FA Cup final at The Crystal Palace in front of a worlds record crowd, an encounter littered with talking points including a running on field feud between Sunderland’s man for all seasons, Charlie Thomson and Villa’s Hampton. 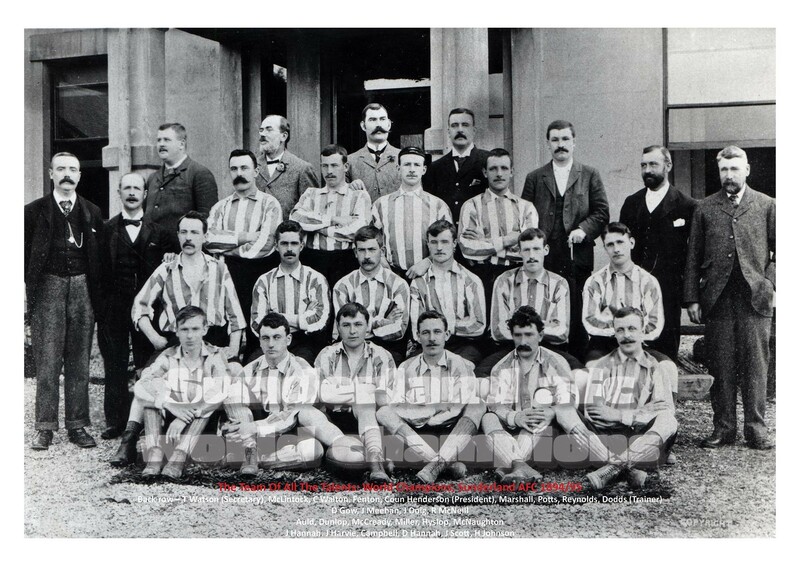 In the 1893/94 season Sunderland were finally beaten at home losing to Blackburn Rovers 2 v 3. That defeat was the red and whites only home league defeat in 81, a run stretching from November 1890 to a September 1896 defeat by Bury. In that sequence Sunderland scored a remarkable 270 goals. The 1893/94 campaign was captain and talisman Johnny Auld’s last full season with SAFC and he would play just 4 games the following season. The end for Auld was the end for the original Team Of All The Talents; although the capture of the world crown and another league title in 1894/95 was The Team’s final swansong. 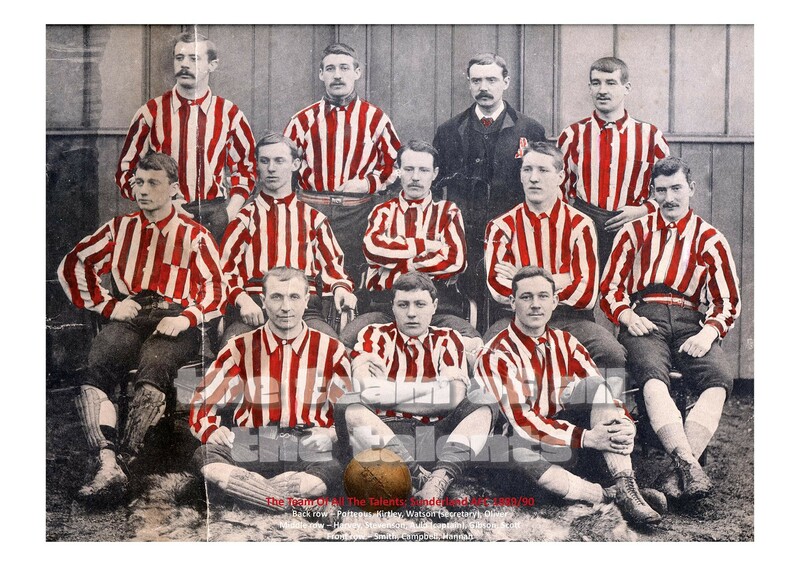 Sunderland won the 1894/95 title by 5 points from Everton in second place and once more went undefeated at home all season winning 13 and drawing 2 of the 15 matches played on Wearside. We are now in the era of the Premier League and all eyes have turned to the likes of Manchester City. The relevance of The Citizens is that their success is current and modern. Lets not forget though that The Team Of All The Talents success was once current and modern and they were the equivalent of what Manchester City are today, almost unbeatable in the league. Sunderland would of course go on to enjoy more pre war success, although the unfortunate interludes of WW1 and WW2 stopped SAFC dead in its tracks just as it was building superb sides. This was the tale of The Team, still revered by Sunderland AFC historians and its right that their legacy and story should be told, albeit briefly on Ryehill Football. Although he played just 114 games for Sunderland; Johnny Auld was arguably one of the clubs most influential players of all time. He led a superb team that included club legends such as Doig, Hugh Wilson and Johnny Campbell. They blazed a trail through English football and for SAFC and were a huge draw wherever they played. Multiple league champions (3 in the clubs first 5 league seasons) and world champions; The Team Of All The Talents was unarguably Sunderland’s greatest ever team. Stretching from 1889 to 1895 it was a tale of almost unparalleled league success.